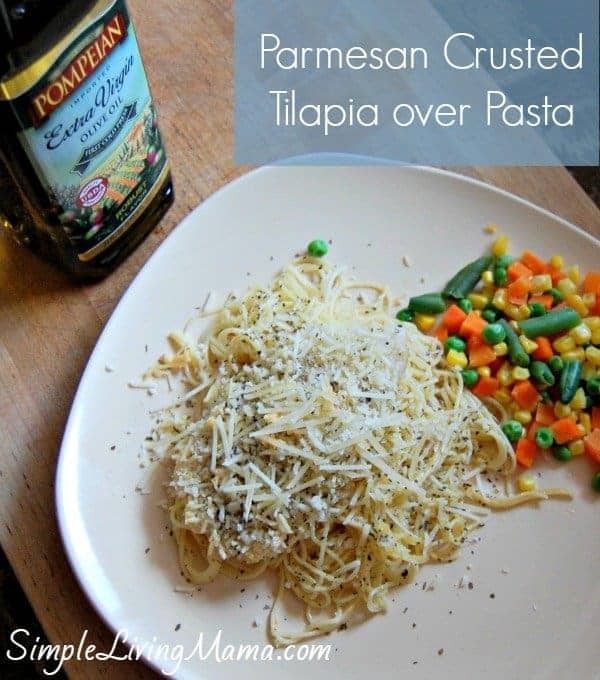 I am so excited to have partnered with Pompeian to bring you this delicious recipe! 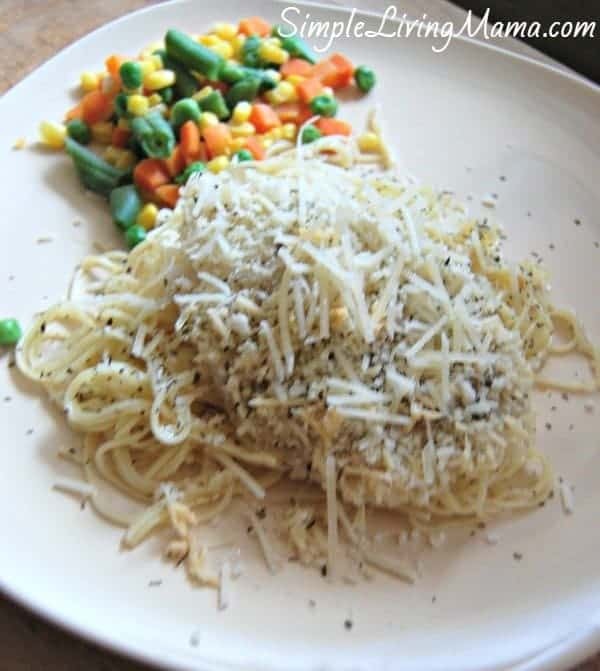 This Parmesan crusted tilapia over pasta is a quick weeknight meal that’ll make you feel fancy! When I am rushed for a quick week night meal, I know that I can usually pull some tilapia out of the freezer and quickly thaw it. I wanted to come up with something tasty, and I love Parmesan cheese and pasta. I thought a nice Parmesan crusted tilapia over pasta that has been prepared with garlic and oil would be absolutely delicious. I was right! It was a pretty tasty meal! Now it’s time to cook! Preheat your oven to 400 degrees. Combine Panko, Parmesan cheese, garlic salt, and Italian herbs. I used a food processor to get a finer texture. Rub. 2 Tbsp. olive oil on fish filets. Press breadcrumb mixture into fish and places on a foil lined baking sheet. Bake in the oven for 15-20 minutes, until fish flakes with a fork. In a skillet, heat olive oil over medium heat. Add minced garlic and red pepper flakes, and cook until lightly toasted. 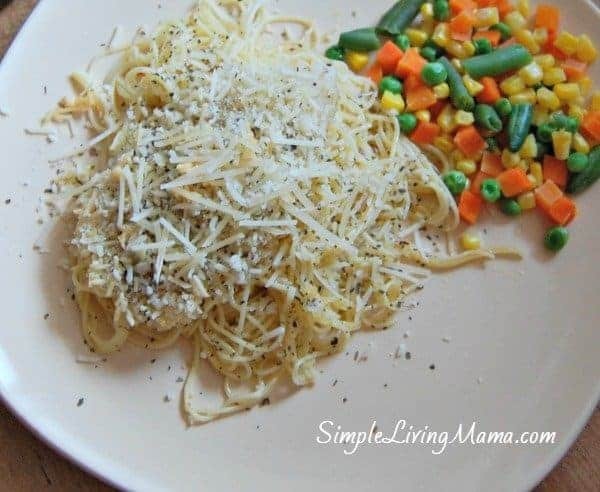 Toss drained pasta with oil/garlic mixture and stir in extra Parmesan cheese. 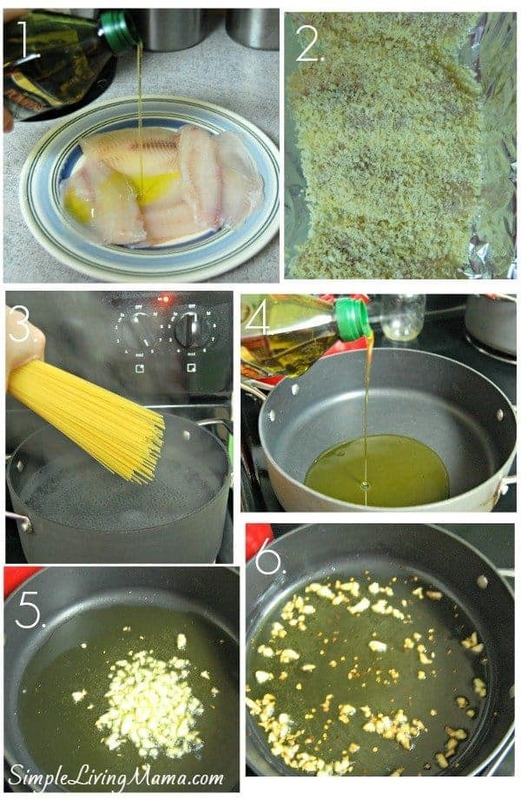 Serve fish over pasta with extra Parmesan if you like! 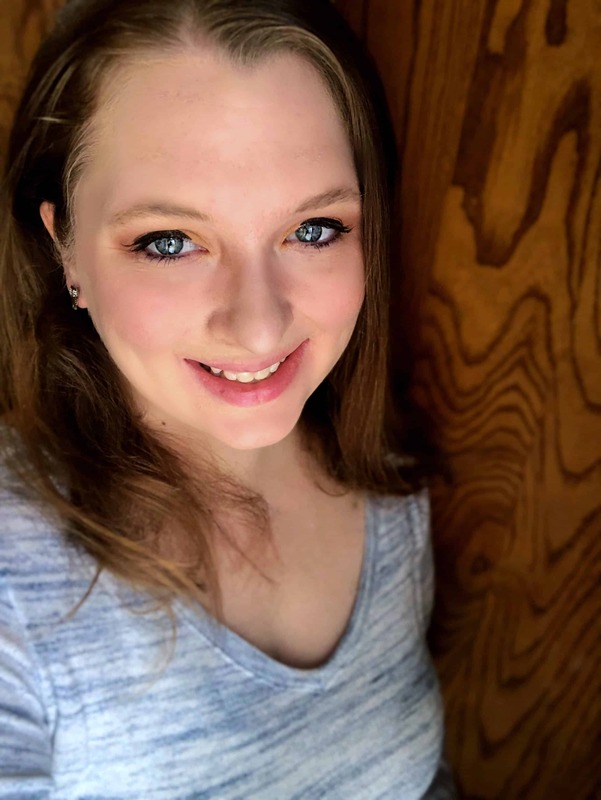 Now, I want to share something special with you! Pompeian is helping you share your favorite recipes with the ones you love! Just in time for the holidays you can create your very own personalized label for your bottle of Pompeian Extra Virgin Olive oil complete with recipe and photo of your choice! Just visit Pompeian’s Facebook Page to create your own! 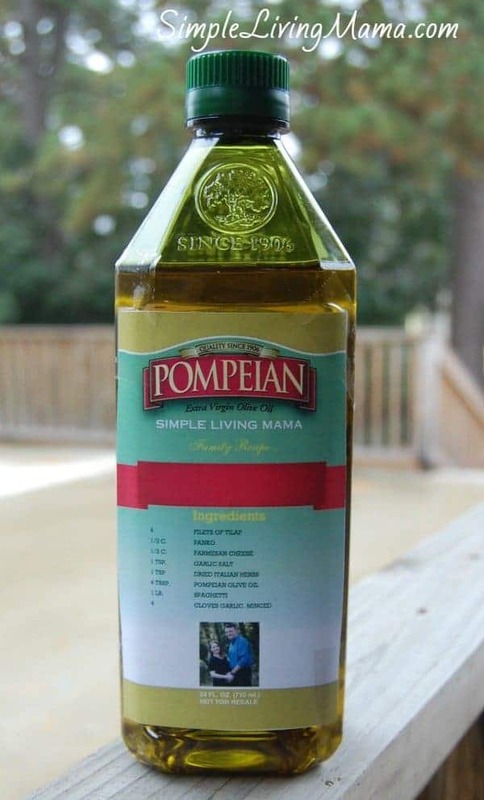 Did you know that Pompeian is the first and only extra virgin olive oil to carry the USDA Quality Monitored Seal? They also offer a variety of other yummy products such as blended oils, cooking wines, vinegars, and cooking sprays. 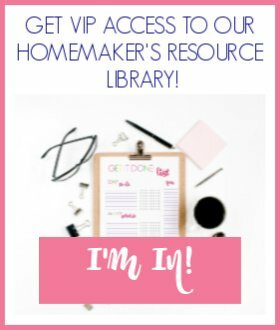 Just think of all the great recipes you could make! This post was sponsored by Pompeian. This recipe looks delicious! I’ve tried something similar with chicken, but I’d love to try the Tilapia! It is yummy! You should try it! Sounds good! Thanks for sharing on Tasty Tuesdays! What a great recipe for the Tilapia, it looks delicious. Thanks so much for sharing with Full Plate Thursday and hope you are having a great week.